This report will be brief, but I hope I’ll be covering all the highlights of the month. Next generation LabourStart: Our Android app is ready, and I’m making some final tweaks before submitting it to the Google Play store and elsewhere, and then publicizing it widely. I do think this is a huge step forward for us, we’ve gotten good feedback from those who’ve seen it, and mobile apps like this one are increasingly going to be our main platform. 2015 Retreat: We now have an organizing committee of 7 people, and have been putting together the basic elements. We’ll have a Skype conference call in November and will begin inviting people then. Campaigns: We only launched two campaigns in October (as compared to 5 in September) — for the trade union at WIPO (5,813 supporters) and for workers at Zara in the USA (5,004 supporters). More campaigns are on the way, including another one from the ITF. We gave a lot of help at the beginning of the month to IndustriALL, which was doing a Thunderclap on precarious work. Fundraising: Some good news this month as the National Executive of Unison in the UK votes to give us £3,000 and the Norwegian union Industrie Energie votes to donate $5,000. In addition, Kevin Curran’s marathon run for us generated £1,202 (71 individual contributors). Internationalization: We’re doing a lot of work to make sure the languages we campaign in and post news in stay alive, even when individuals who were doing the work drift away. Big efforts were made to recruit new correspondents in Denmark and Finland this month with good results in the latter country. Italian remains our biggest mailing list that is not getting regular mailings, so we appealed this week to our entire Italian list producing dozens of volunteer translators. We’ve received this appeal from ITUC Africa that I think is deserving of our special attention — so it’s a top global news story on LS, and I’m promoting it widely on social media. Please do what you can to encourage your unions to donate generously. 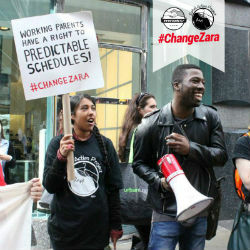 We’ve been asked by UNI Global Union to help build support for a US-based campaign targetting Zara. It’s our first new campaign in 22 days. Please support this important campaign, help us to translate it, and spread the word. The screenshot on the left — that’s the next generation of LabourStart. This is how our thousands of readers around the world are increasingly accessing the net — and developing a mobile presence for us is a top priority. 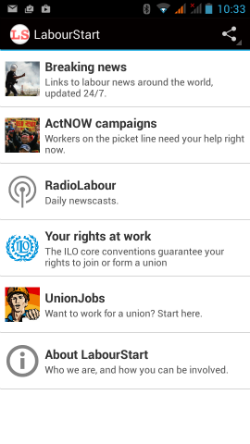 Our new app shows our top news, gives access to our campaigns, allows you to listen to the most recent RadioLabour broadcasts, shows which union jobs are on offer around the world, and even links to all 8 ILO core conventions. And of course there’s a page telling you all about LabourStart, full of links. There’s more to come, including versions in other languages, ways to access news from specific countries, and so on. But this version is nearly ready to submit to the Google Play store and is now being looked out by a team of 10 volunteers who will no doubt find errors and make suggestions. If you have an Android smartphone or tablet and want to help us test our new app, please email me. For the second time in the last 13 months, we’ve been asked to launch a LabourStart campaign in defense of workers’ rights in a UN agency — this time at the World Intellectual , Property Organization (WIPO), where Moncef Kateb (pictured), the head of the staff union has been sacked because … he was a troublemaker. Please sign up to this campaign and help us spread the word. Thanks. All our major mailing lists shrunk in September. Every time we promote a campaign that’s not on our site (e.g., the IndustriALL Thunderclap, or the IUF and HKCTU campaigns on Hong Kong) the net result will be a decline in subscribers. Some of the addresses will bounce, others will unsubscribe. The only time we pick up new subscribers is when we run a campaign of our own — and only when that campaign is compelling enough to attract new supporters. Mailing lists where there was no change are ones where there were no mailings — these are lists that we are not using because our volunteer translators have become inactive. This is a particular problem with Italian, Korean and Chinese, all of which are lists with more than 1,000 supporters. Growing lists are shown in green; shrinking lists are in red. The previous month’s total is in brackets. A big victory followed an international campaign, including LabourStart’s ActNOW appeal. Remember this campaign? (“Philippines: Stop union-busting at NXP Semiconductors”). It generated 8,500 messages of protest, 885 Facebook likes, 61 Tweets and appeared in 13 languages. And this week we learned that we have won — a big victory for the workers. Things picked up in September even though August was hardly a quiet month for us. Office: LabourStart is now firmly planted in Muswell Hill as I learn to once again work from home (with some days working in the British Library). Finances: Our finances have improved a bit this month. We have received a substantial contribution from Fafo in Norway, from the FDHT in Geneva and also many individual donations raised on behalf of Kevin Curran’s marathon run for LabourStart in October ($1,894 so far from 67 contributors). The promotion of Fastmail as a Gmail alternative on 19 September has generated very little income for us. 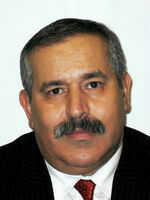 Unison’s National Executive is due to consider a proposal to make a donation to us this month. We have been able to announce a victory at Autogrill (Germany) and will soon be able to announce another from the Philippines at NXP. We closed the Swaziland campaign after hearing that the Prime Minister has decided not to strangle trade union leaders. I also closed campaigns in Turkey and Korea after three months; the unions have not gotten back to us with updates. In addition to promoting our own campaigns, we have helped the following organizations with promotions of their campaigns which we do not host: Hong Kong Confederation of Trade Unions, Australian Council of Trade Unions, IUF, IndustriALL (Thunderclap) and BWI. Most other campaigning organizations will generally not do dedicated mailings to promote other organizations’ campaigns, but we do this regularly. All our campaigns are now also in Swedish, and this is what now shows on the Swedish home page. Books: Book sales are just under 5,700, which is very good, and some Amazon payments have started to come in. I continue to work on our next book, which consists of speeches given at the Berlin conference. Derek has been working on a Canadian edition of our Global Labour Movement book. And we’ve reached agreement with Joe Atkins to publish his collection of essays from activists around the world on migrant labour in late 2015. I spent a couple of days at the DGB training centre in Hattingen, Germany doing a course on online campaigning with the European Trade Union Institute. Derek has done some courses with Unifor in Canada. In November, Espen and I will be in Stockholm meeting with Swedish trade unionists to discuss cooperation (which has already begun). In early November, I’ll be in Vienna attending an OSCE conference, which I will cover for Equal Times, and have already written to LabourStart subscribers there suggesting a meeting. The FES Media project in Africa has shown interest in cooperating with us and I had a 30 minute phone call with their staffer in Windhoek, Namibia about this. Pete Moss, one of our Australian correspondents, visited Indonesia and wrote up a report – see below. Retreat: We have begun some internal discussions about possibly hosting a LabourStart retreat in Tunis in March 2015. More details coming soon. We are trying out a new online tool called Trello to coordinate this. Ello: Finally, LabourStart is probably the first labour movement institution with a page on Ello, the new social network. For details on most of these, see the posts from throughout September on Inside LabourStart.